The Kenmore Elite Induction Range is the best introduction to induction cooking if you’re used to your sure and dependable gas or electric stove. With its speed, responsiveness, energy efficiency and easier clean ups, induction is today’s most advanced cooking technology. By producing a magnetic field which heats pots and pans directly, cutting-edge Induction Cooking brings your favorite meals to a boil quickly, saving time and resources. Featuring up to 25 cooking functions, Precision Set Electronic Controls are ready to prepare an entire cookbook of meals with just a few taps of the control pad. 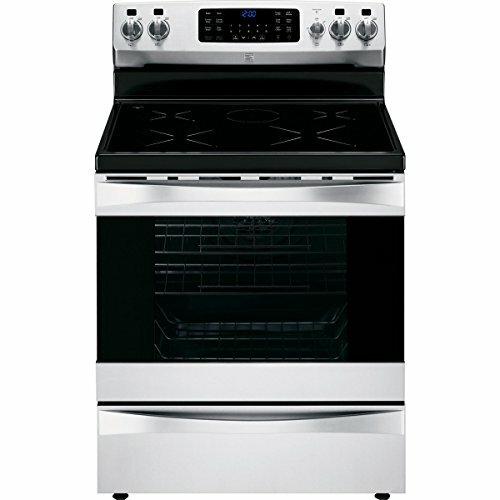 Purchase Kenmore Elite 95073 6.1 cu. ft. Self -Clean Freestanding Induction Range w/True Convection in Stainless Steel, includes delivery and hookup at Discounted Prices ✓ FREE DELIVERY possible on eligible purchases. The Kenmore Elite Induction Range is the best introduction to induction cooking if you're used to your sure and dependable gas or electric stove. With its speed, responsiveness, energy efficiency and easier clean ups, induction is today's most advanced cooking technology. By producing a magnetic field which heats pots and pans directly, cutting-edge Induction Cooking brings your favorite meals to a boil quickly, saving time and resources. Featuring up to 25 cooking functions, Precision Set Electronic Controls are ready to prepare an entire cookbook of meals with just a few taps of the control pad.